The reports describe the process and findings of the Sudbury & District Health Unit (SDHU) Canadian Health Services Research Foundation (CHSRF) Executive Training for Research Application (EXTRA) Fellowship. The project sought evidence to guide the health unit to orient programs and services to reduce social inequities in health. Through an extensive literature review process, the project identified 10 local public health practices that have potential to reduce social inequities in health. These practices have also been presented with related tools and resources in a series of fact sheets, designed for public health practitioners and community partners. Guide local public health action in orienting programs and services to reduce social health inequities. Learn about the evidence supporting local public health action to reduce health inequities. Sudbury & District Health Unit. (2011). 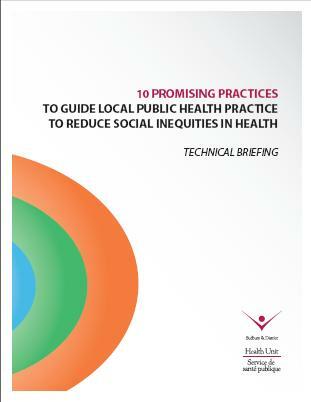 10 promising practices to guide local public health practice to reduce social inequities in health: Technical briefing. Sudbury, ON: Author. Retrieved from http://www.sdhu.com/uploads/content/listings/10PromisingPractices.pdf. Sutcliffe, P., Snelling, S., & Laclé, S. (2010). Intervention project final report: Implementing local public health practices to reduce social inequities in health. Sudbury, ON: Author. Retrieved from http://www.sdhu.com/uploads/content/listings/FINALIPPRSDHUMay2010.pdf. Sutcliffe, P., Snelling, S., & Laclé, S. (2009). Intervention project progress report 2: Research-oriented decision-making to guide local public health practice to reduce social inequities in health. Sudbury, ON: Author. Retrieved from http://www.sdhu.com/uploads/content/listings/EXTRAProgressReport2SDHUJuly2009_External.pdf.